part-time houseplants. Except perhaps in late winter. 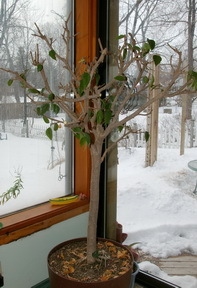 By mid March to Early April it has become less then exciting as a houseplant. It has dropped a lot of leaves and thus looks a bit straggly. The Aphids and Whitefly are starting to breed faster than I can wash them off. It rarely puts out any of its glorious blooms. We are now just keeping it alive until it can return to the outdoor patio. Hibiscus Pruning Time! We get to reduce our frustration level by taking the pruners to this bedraggled specimen. Why is taking the pruners to an irritating plant such a therapeutic experience? By pruning it in late winter, it will have started significant regrowth by May and will be ready to fill the corner of the patio with its mass of double, salmon coloured, blooms for the entire summer. We can be quite brutal with it. I will remove at least half and probably as much as 2/3 of the plant. Almost all of the growth that it made last summer will wind up in the compost heap. There will be few if any leaves left upon it and many observers would think that I had killed it. Not a chance. It will burst forth with fresh new growth in a couple of weeks. How and Where? Retaining any existing leaves is a minor consideration. 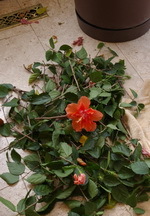 If this is the first time you have undertaken Hibiscus pruning then take each significant branch and reduce it by 2/3. Find a leaf scar that faces down and/or out and make a clean cut just beyond that point. We choose a downward facing leaf scar because that will force the bud that emerges to grow outward rather than straight up. Any thin straggly branches can be cut back to the main branch they are growing from. While doing this, you do of course, give some consideration to creating a symmetrical globe shape. On a plant that as been pruned in previous years, you essentially remove most of the new growth from the previous year so that you start again from the basic structure and shape. Now What? Give the plant a good watering after the pruning and keep it in the warm sunny location that it has been in all winter. In 2 - 4 weeks you should see a flush of new buds opening all over the plant. At this point give it a soaking with a liquid fertilizer such as 20-20-20. Keep an eye on that new foliage for any sign of Aphids or Whitefly and move them off with a water or insecticidal soap spray. They shouldn’t be much of a problem. 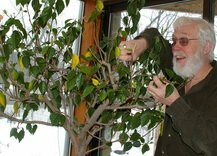 Enjoy the results of your Hibiscus pruning and wait until a reasonable frost free date and move your thriving Hibiscus outside.